The following is a collection of Phase Noise and other measurements made with a Timepod and some auxiliary components. In all cases the output of a low phase noise 10MHz OCXO was amplified by a low noise pushpull transformer feedback Norton CB Amplifier to around 18dBm or so. A 10MHz signal was split in 2, one output drives the input of an OPA653 evaluation board whose output, in turn, drives the Timepod reference input. The other output drives the input of another OPA653 evaluation board whose output drives the Timepod Signal input. A 10Mhz signal is split in 2 with one output driving the Timepod reference input whilst the other output drives the input of an LTC6957-4 evaluation board. The output from the evaluation board is split in 2. One output of this splitter is low pass filtered and drives the input of an RF amp (HELA10) whose output drives the Timepod CH0 input. The other output is low pass filtered and drives the input of another RF amp (HELA10) whose output drives the Timepod CH2 input. Cross correlation averages the PN noise contribution of the HELA10 amplifiers down below the PN noise contribution of the LTC6957-4. A 10Mhz signal is split in 2 with one output driving the Timepod reference input whilst the other output drives the input of an HX24190. 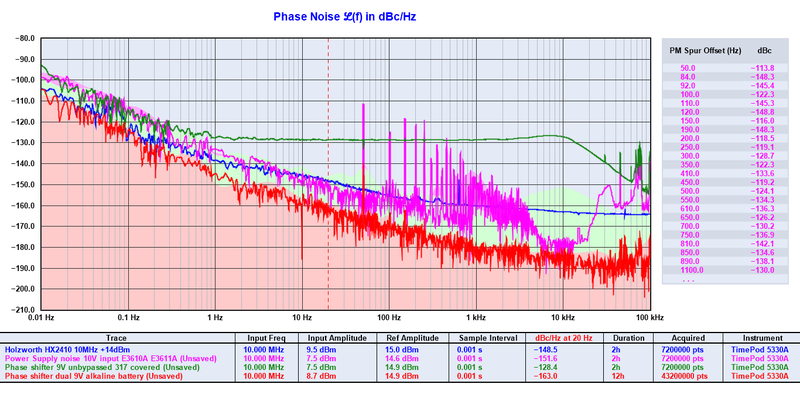 The output from the HX2410 drives the Signal inpuut of the Timepod. A pair of Minicircuits JSPHS12 phase shifter was used to allow the supply output noise to modulate the phase of a 10MHz signal. The 10MHz source was split in 2 and one output connected to the timepod reference input whilst the other signal was split in 2 again with 1 output connected to CH0 via a JSPHS12 phase shifter whilst the other output is connected to CH2 via another JSPHS12 phase shifter. The control inputs of both JSPHS12 phase shifters were connected to the supply output (set to 9V). Cross correlation within the Timepod avaerages the phase shifter noise down whilst preserving the phase noise due to noise on the phase shift control inputs. Shielding the phase shifters from air currents is necessary to reduce phase fluctuations due to air movement. 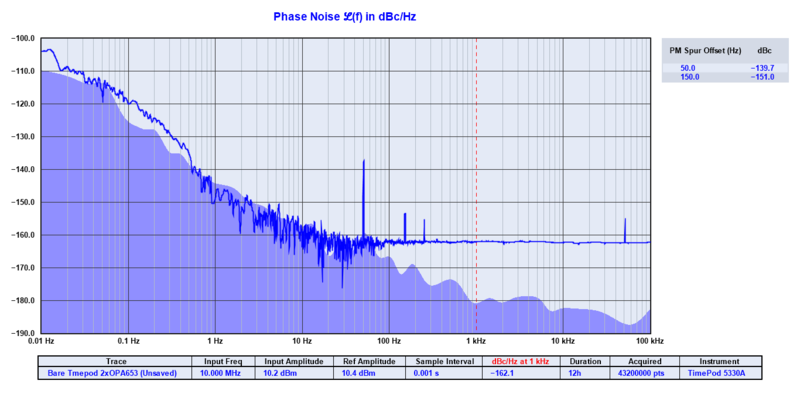 This effect is most pronounced below 100Hz offset.